LAST UPDATE: August 19, 2013; cover added on December 29, 2013. Project mission: restore John Carpenter's The Thing video to be closest to the theatrical version as could be possible at the present day, using the best video sources chosen from all the various available versions; adding the best original and remastered audio soundtracks in different languages. Video sources: luma from HD-DVD, chroma mainly from Laserdisc. Audio sources: uncompressed PCM soundtracks captured directly from Laserdiscs; AC3 soundtracks from DVD; DTS soundtracks from BD. english, italian, french, spanish, german from the BD. Project status: RELEASED on August 19, 2013, on myspleen. HD-DVD VC-1 and DVD MPEG2 are converted using the Lagarith lossless compression (YV12); laserdisc video is captured using the Lagarith lossless compression (YUY2). HD-DVD is used as frame reference (so no frames are cut or duplicated); it's simply converted to lossless with not further processing. PAL UK laserdisc is used as primary color reference: it's captured using AviSynth at its original resolution of 720x576@25fps; then frame rates is changed to 23.976; a rainbow remover is applied to the capture, along with mild noise reduction to get rid of eventual dropouts; at the end, video is upscaled to 1920x816 and frames are cut or duplicated to match the HD-DVD video. PAL IT DVD is used as secondary color reference: it's converted to lossless; then frame rates is changed to 23.976; at the end, video is upscaled to 1920x816 and frames are cut or duplicated to match the HD-DVD video. opening credits (up to "Antarctica, winter 1982") is HD-DVD video "as is", because there is no need for color regrading, as the flying saucer and earth colors are almost the same of the laserdisc/DVD - the same for the end credits, from the last image of the movie. and except few other scenes that have some kind of artifacts (around 1000 frames in total) - there, the ColourMatch is used instead. Then, the result video is saved as lossless, to be converted to lossy AVC for the final Blu-Ray. PAL FR LD is captured (thanks to ilovewaterslides); then converted to 48KHz; as LD video frames are cut or duplicated to match the HD-DVD video, audio is adjusted accordingly to be in sync with the HD-DVD video. NTSC US LDs are captured and processed to be in sync with the HD-DVD video (thanks to Jonno); the letterbox LD is converted to AC3. PAL IT DVD italian, spanish and english commentary AC3 soundtracks are demuxed, then converted to PCM to be processed; as DVD video frames are cut or duplicated to match the HD-DVD video, all the soundtracks are adjusted accordingly to be in sync with the HD-DVD video; the resulted tracks are then reconverted to AC3 to be BD compliant. Jonno, for english laserdisc, all BD soundtracks, missing frames, and A LOT OF HELP!!! Without you, this project could not be the same! THANK YOU VERY MUCH! I don't wanted to derail Jonno's thread more, so I decided to start my own project. His idea (Jonno's) to use the HD-DVD video, along with laserdisc soundtrack(s) is good; I asked in his thread if the HD-DVD video is the best video released until now, and, after I have made some homeworks, I discovered that it is, but... it's not the "perfect" one! I mean, it's better than the BD; the latter has a DNR that cancelled some film drop outs, along with a lot of grain and resolution... so, what is the problem? Is the frame too cropped? I think not - comparing it to my PAL LD (which seems to be one of the finest PAL laserdisc ever produced, a very good Pioneer Cinema edtion) the HD-DVD has often some lines of resolution more on all the four sides, while few times the contrary it's true, but the difference is negligible. I based my suppositions after I've seen screenshot comparison of HD-DVD Vs BD; as I have not (yet) the HD-DVD video, I downloaded a couple youtube HD clips (almost surely taken from the BD) to make some comparisons with my PAL LD captures; altough these HD clips are only at 720p, and heavily compressed, the colors are retained... and, as I wrote before, they are... well, wrong? The LD colors, at the contrary, seems more real to me, even if not perfect - again, a personal thought: so I had the idea to use the HD luma and the LD chroma to obtain the best resolution with right colors, and it seems to work! I don't like pinkish snow and clouds, and you? are these two different dog breeds, or only two dog color varieties? ...or their faces so pinkish! Maybe flames are not so yellow, but neither pink! Because the old adage "A picture worth a thousand words" is ever valid, I carefully choose some extreme screenshots to showcase the problem, but obviosly there are some scenes where the HD colors are better than LD; n those cases, the original chroma will be left untouched or mixed (depending on the scene) to obtain the best colors. I know this is not the best practice, but until there is a valid reference for colors, it's the best I can do! The first thing that struck me as looking wrong with the LD color timing is that the shot of the dog makes its eyes appear grey and colorless whereas you can see clearly in this shot that the dog's eyes are, in fact, brown as in the YouTube HD capture. Great project. Looking forward to the results! That nice, can you explain how you combine the luma and chroma? Cos I want to do the same for Mad Max 2, the Blu-ray have color problems. Those color differences are very interesting. I think for most shots, maybe a mix of both chromas would look best? For the last example, the color pictures of the movie (the one that were outside the theaters were closer to the middle version. thanks for the interest, I hope to receive soon the HD-DVD rip - I also just bought the XBOX360 HD-DVD player just for this project! Sorry, link doesn't work... but I have once a Siberian Husky and, apart the fact that she had one blue eye and one brown, she was almost exactly as the laserdisc's dog - black and white - and not like HD'd dog - fawn and cream... about the eyes: I have seven thai cats (as you could see one in my avatar) and sometimes (it depend from the color of the sky) their eyes seems grey, aquamarine, or almost transparent... so, if I should decide which color timing is right based on the dog's color, I'll go with laserdisc! I admire your ambition, Andrea! 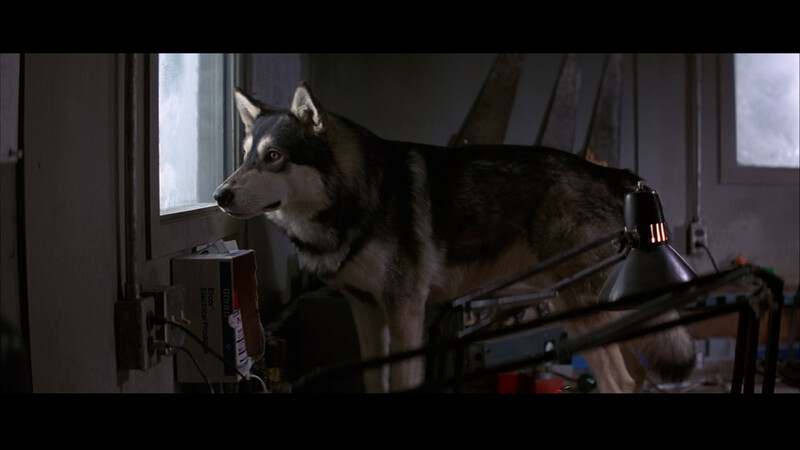 I can't say which I prefer without a better reference, so I have no dog in this fight (Siberian Husky or otherwise). Getting access to a film print may be a stretch, but what other release formats could we cross-check? VHS? Was there a Beta tape? If you scroll to the bottom you'll see the shot of the dog staring out the window in which it appears that this particular dog definitely has brown eyes. I'd be interested to see the LD color of this shot to see if it stays consistent with the one above. If you scroll to the bottom you’ll see the shot of the dog staring out the window in which it appears that this particular dog definitely has brown eyes. I’d be interested to see the LD color of this shot to see if it stays consistent with the one above. Don’t worry, thank you for providing the new link. Just finished to rip the italian PAL DVD - primarily to have the italian soundtrack; I was checking the video, and guess what? colors are really close to the ones of the laserdisc! I think to merge the PAL DVD and LD together, to achieve the “best of both (chroma) world”: even if this DVD is not anamorphic (sigh!) it has 360x194 chroma resolution, while the LD should have something that could stay from around 160x338 to 240x338 - more probably close to the second figure, if not even higher; while the HD-DVD should have 960x408 - but luckily human eye are less sensible to colors, so an high definition luma image with a lower defintion (than usual 4:1) chroma will be percieved as high definition image as well!!! Thanks for providing that shot. The LD colors do certainly seem consistent with the previous shot of the dog you posted. I think I'm going to agree with Jonno; none of the color schemes look bad to me, so I'd base my preference on whichever is more accurate to the original theatrical timing. Are there any references floating around by any chance?? Interesting... very very interesting. Not only the project itself but the technology potential. I didn't know you could effectively and cleanly combine the chroma and luma so as to transfer the color timing of one release to another. I really look forward to this release, especially since it's using the HD-DVD video. Would love to see all the most screwed up color-timing restored with other releases. Suspiria, the James Bond films, Aliens, the Matrix, Blade Runner... All restored to their color-glory. (Sorry to get off-topic). Yeah could the Matrix be done the same way? THEN I can do it - I have the sources! matrix hd-dvd and bd are the same. Yeah they are the same but the colors on the first dvd release are of course right. That would be awesome if this could be done though! So, if someone with the US DVD would like to share his english DD 5.1 soundtrack, I could avoid to do the conversion from 25fps to 23.976fps - and avoid some kind of audio quality loss too! Do a search here, there's already a Matrix restoration done. BTW the LD colors of The Thing are all wrong. To achieve a better presentation, you should completely retime the whole movie, but you have no reference to what it actually looked like in theaters. Do a search here, there's already a Matrix restoration done. It's not a restoration, it's just a naturalization of the color timing which removes all tints, even those that were present theatrically. What people would like to see is a scene-by-scene regraded version that matches the colors of the original DVD release. That would be the russian hdtv -- I also did remux my Pal DVD to 24fps with the correct audio synced, so it's like mini-hd (better res than the NTSC). zeropc, thanks a lot! I'm downloading them right now, and updated first post with credits to you and to The Aluminum Falcon - thanks to you too, of course!